1. 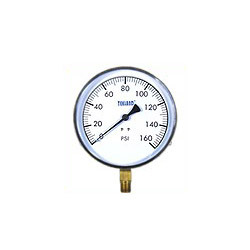 Contractor's gauge, suitable for using on air conditional purpose. 2. Special diameter: 4.5", model no. SP-A. 1. Diameter: 4.5". 2. Pressure range: -30 inHg ~ 0 ~ 600 psi. 3. Connection: 1/4" NPT. 4. Material: case: SUS304. 5. Accuracy: +/- 1.5%.